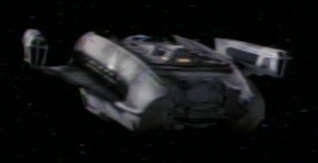 Sydney Class Transport vessels are an older design, first seen to be active in the late 23rd Century ("Relics"[TNG5]). The registry of one such vessel, the USS Jenolan, suggests a commissioning date of approximately 2260. Judging by the nacelles and assuming they are equal in length to Constitution/Miranda nacelles (i.e. ~151.6m length), ships of the Sydney Class are on the order of 235 meters long. The bridge module size is in rough agreement with this value. It does not appear as if the ships were intended to land to offload personnel and cargo, although the bottom of the vessel is large and relatively flat as seen on screen. (The model has a large yellow pad on the underside, though this is not seen in the episode featuring the ship.) However, the angle of the underbelly (or even the pad) would require the ship to sit on the surface with her nose pointed downward. Landing pads of some sort to prop up the front end are a possibility, but none have been observed. Vessels of this type may still be in service. Geordi gave no indication of the class's retirement in "Relics", and specifically mentioned that the performance of that ship type might allow it to be in service as of the late 2360's. Among other things, he mentioned that the ship could probably "run circles" around the Enterprise-D at impulse speeds. A very similar vessel has been seen on several episodes of Deep Space Nine. The shields of the Jenolan were apparently of the 'bubble' type, judging by the image below. 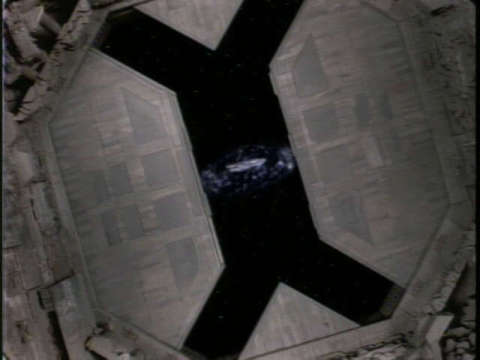 The scene is of the Jenolan being used to prop open an access door of the Dyson Sphere discovered in 2369.